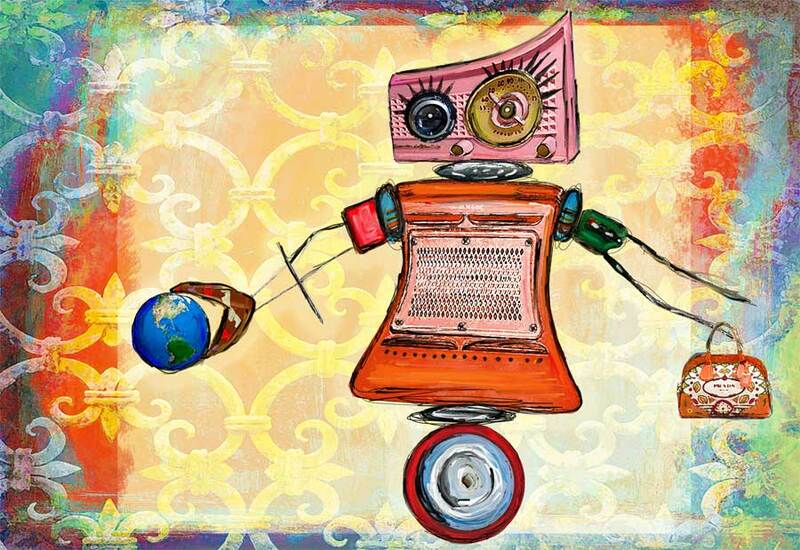 This robot gal is named after my sweet niece Catherine. The human Cat is funny, fashionable, and beautiful just like her Mom. I gave my robot a Prada handbag and the world in one hand, because even though sweet Cat does not know it right now she can indeed hold the world in her hand some day and have anything she wants in life. I wanted to create a colorful female robot for Cat today because she is having a tough time and she is on my mind. I may not show it to her , I dunno, how many 12 year old girls really want to be turned into a robot? A 12 year old boy maybe.